Much of Scauflaire’s work is representational; he produced numbers of portraits, figure studies and nudes, which show influences running from Picasso to Paul Delvaux with a hint of Modigliani, and a similarly varied range of still life subjects. 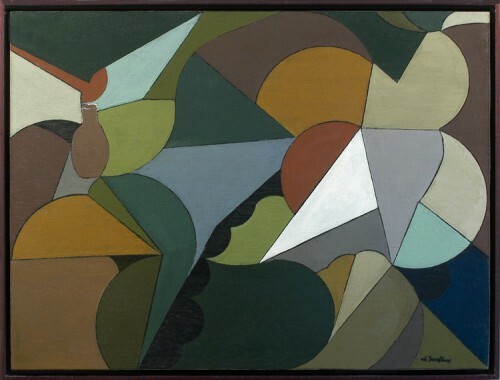 However, a rare abstract or two creeps in amongst the others: for example, Composition of 1937, with its floating autumnal pattern based on playing cards. The present work creates a tension of segmental and triangular forms, angular shapes and soft curves; it is painted in a harmony of earth colours, greys and greens – shading from bottle green and teal to olive and eau de nil. The bottle is a flask-like shape, placed on a table with a scalloped tablecloth, surrounded by padded chairs, art deco stools and lamps… perhaps. Edgar Scauflaire (1893-1960) was born in Liége, and studied at the Académie des Beaux-Arts there, under teachers such as Auguste Donnay, Adrien de Witte, Francois Maréchal and Emile Berchmans. He came under the influence of Picasso and Braque; his nudes have a strong similarity to Picasso’s monumental nudes of the 1920s, whilst his still life paintings are related to those of Braque. However, his work never degenerates into copying nor pastiche; and his pastels have a particular charm in their technique and colouring. As well as paintings, pastels and murals, he produced tapestries, frescoes and paintings on glass; he also created artwork for posters, such as that for the 1939 Expo Universelle in Liége. In 1948 he exhibited work at the Salon d’Art Moderne et Contemporain in Liége which was greatly praised. He showed at the Biennials in Venice (1924, 1938, 1948), those of Sao Paolo (1951 & 1953), and Menton (1953), as well as the Salon des Tuilleries and the 1958 Exposition Universelle in Brussels. He was awarded the Prix de l’Association Industrielle de Santa-Margarita Ligure, and helped to found L’Association pour les Progrès Intellectuels et Artistique de la Wallonie. His work is in the collections of the Belgian State, and the museums of Liége, Verviers and Brussels, Strasbourg and Buenos Aires.